As a result of a century of engineering experience, Tsubaki introduces a revolutionary breakthrough in stainless steel products – Super Stainless Chain. 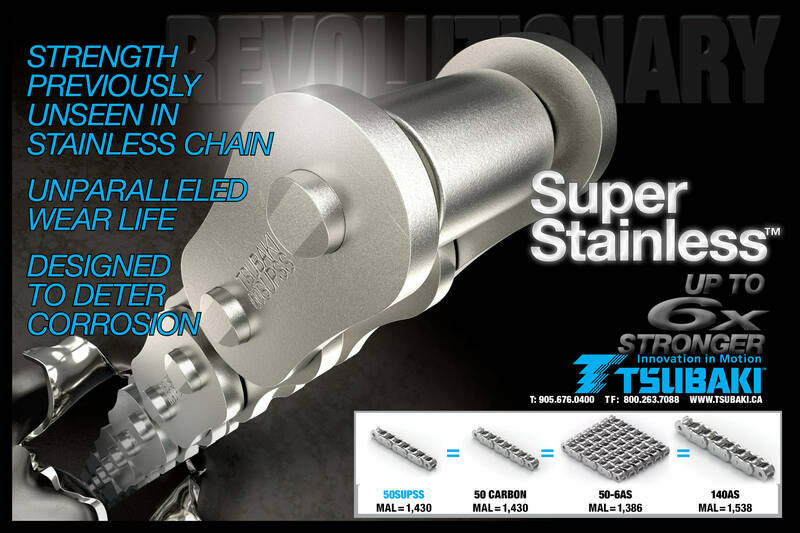 With the corrosion resistance of stainless steel coupled with the strength of carbon steel, the Super Stainless series is readily equipped to handle even the toughest of applications. Strength that is six times that of conventional 304 stainless steel, unmatched wear life, and construction made to deter corrosion all contribute to making super stainless truly in a league of its own. To find out more about our unparalleled Super Stainless chain, please contact your local Tsubaki representative at 905-676-0400. Designed for aggressive bulk material handling environments, Workhorse elevator chains are made of premium high strength steels and refined series of heat treatments – guaranteeing to bring superior strength, utmost durability and exceptional dependability to your operation. Ideal for fine particle environments such as cement, lime, gypsum, salt and potash; Workhorse elevator chains are born tough for tough environments. Combination of premium materials and refined proprietary manufacturing process make these chains resistant to demanding forces of aggregate elevators. Tsubaki offers a wide range of premium upgrades, such as plated pins/bushings, and patented joint seals, for your specific application that can be incorporated individually or in combination. For more information, please contact your local Tsubaki representative at 905-676-0400 or visit http://www.tsubaki.ca. Asphalt is tough! The combination of hard aggregates, intense heat and the need of a continuously running operation during paving season demands tough chains to rely on. Tsubaki’s asphalt chains have superior quality, increased strength and longer service life. They deliver reliable performance even with high shock loads to decrease downtime and unplanned stops. Tsubaki offers Incline Conveyor Chains in 4” and 6” pitch with K- or slotted M- style attachments that are designed for maximum strength and longevity. Side bars are hardened to withstand high impact loads and rollers are heat treated to resist inherent abrasion for a smooth running operation.